"Laughing Song and Merry Dance"
The Toronto Operetta Theatre's current production of Gilbert and Sullivan's "The Mikado" is musically and dramatically one of the best the company has presented. The cast of young professional opera singers communicates the melody and vigour of Sullivan as his most inspired. That these singers are also fine actors insures that none of Gilbert's wit is lost. Those familiar with G&S only from amateur productions with be delighted to hear how Sullivan's music blooms when opera singers sing it. Eric Shaw, with his burnished tenor, is ideal as Nanki-Poo, the disguised son of the Mikado of Japan. His excellent phrasing brings out the Handelian parody of Nanki-Poo's recitatives and his voice soars effortlessly in his solos and duets. He is well matched with Elizabeth DeGrazia as Yum-Yum. Her bright, clear soprano brings out the full beauty of her Act 2 aria "The Sun Whose Rays". Under Guillermo Silva-Marin's insightful direction they are not the bland lovers as they are so often presented. Silva-Marin has the conspiracy against Ko-Ko begin much earlier than I've ever seen before. Shaw's knowing looks and wary glances suggest that it already begins with Nanki-Poo's attempted suicide and that ever further step is proceeding as he has foreseen. At the same time, Yum-Yum is not simply a delicate little blossom. DeGrazia shows that she is, in fact, a quintessential Gilbertian character motivated primarily by self-interest. DeGrazia's use of ultra-precise upper-class diction amusingly reveals how vain this teenaged girl really is. Gregory Cross is appropriately stuffy and full of himself as Pooh-Bah and very funny in "Long Life to You" solo of Act 1. Deborah Overes' Katisha is more like a disgruntled schoolmarm than a tigress, but this fits well with the sympathy she arouses in her beautiful singing of "The Hour of Gladness" in Act 1 and "Alone, and Yet Alive" of Act 2. 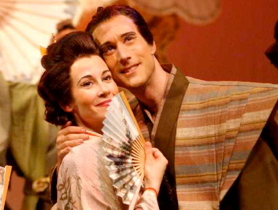 Gregory Dahl captures the youthful glee of the Mikado but not much of his menace. Rather more maniacal laughter in "My Object All Sublime" might be in order. But it is wonderful to hear this famous song by so powerful a voice. Newcomer Giles Tomkins displays a warm baritone in the role of Pish-Tush, and Rosalind Lewis as Peep-Bo and Heather Shaw as Pitti-Sing well distinguish Yum-Yum's fellow schoolmates. There is little doubt that the crowd favourite is Keith Savage as a rather more befuddled than dim-witted Ko-Ko. His expert comic timing alone is a delight. With an excellent sense of movement, his is a far more physically active Lord High Executioner than usual. His voice quality and phrasing will remind devoted Savoyards of John Reed, who sang the "crabby old man" roles in the much-loved D'Oyly Carte series in the 1960s. Guillermo Silva-Marin has followed a good policy in updating Gilbert's text. For Ko-Ko's "little list" or the Mikado's "punishment fits the crime", we hear the original without additions and then have a reprise with up-to-date references to Enron, cell-phone users, Harry Potter and, of course, Dubya. Since there is no credit for it, it seems Silva-Marin has also choreographed the show. The singers are in constant movement during songs, sometimes in complex patterns, sometimes as the "three little girls from school" doing the Macarena. Some may be disappointed to see that the orchestra consists of only nine members. (The budget has obviously gone toward the rental of the gorgeous costumes and wigs.) But as soon as Derek Bate begins the overture you know the show is in good hands. During the overture the bond sounds like a refined salon orchestra. While with one player to a part the ensemble can never achieve the full force the finales require, the benefit is that each of the line of Sullivan's writing can be better heard and Gilbert's words are always crystal clear. Five red poles decorated with twelve paper umbrellas each are enough to suggest the setting while Cameron A. More's effective lighting enhances the changing moods. Ontario has seen more elaborate productions of "The Mikado", but rarely one as well sung as this. If Gilbert's words and Sullivan's music is what you prize most, this "Mikado" should be just your cup of tea. Photo: Elizabeth DeGrazia and Eric Shaw. ©2003 Toronto Operetta Theatre.